Easel 18" wide, clear. Adjusts in angle and height. 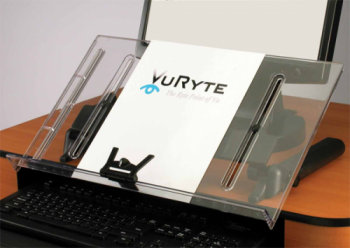 Drops below desktop for keyboard systems. Mobile. Lightweight. Clip and Line Guide. 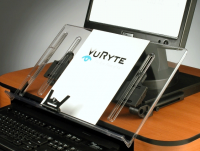 Your ergonomic work-horse! 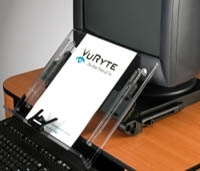 I ordered the VuRyte VUR 18DC Ergo Document Holder and I am impressed how fast it was shipped to me. It came in a day. Thanks so much! Also I am happy with the purchase. It helps me so much in processing my work at my desk. I love it. One thing I didn't like was the shipping charges. I find it alittle too high. But I looked around and I found your company to be the cheapest by a few dollars with shipping. Overall great product! !